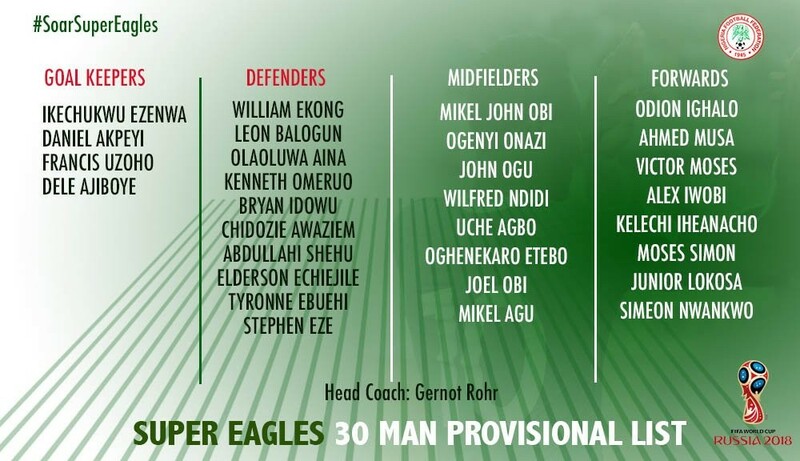 The head coach of Super Eagles of Nigeria, Gernot Rohr, has just released a 30-man provisional list ahead of 2018 World Cup in Russia. The list which includes players like, Mikel John Obi, Victor Moses, Ahmed Musa, Alex Iwobi, Kelechi Iheanacho, and Odion Ighalo among others was released on the official Twitter page of Nigeria Football Federation (NFF). Nigeria will face Argentina, Iceland and Croatia at the World Cup tournament taking place in Russia next month.